This Slow Cooker Mexican Corn Chowder is sure to be a crowd pleaser. and this can be made with frozen corn so you can make it any time of year. 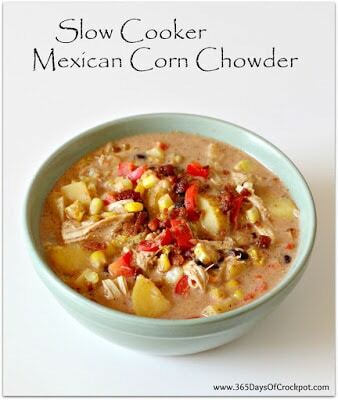 Enjoy Slow Cooker Mexican Corn Chowder on a cold winter night. It’s full of chicken, yellow cubed potatoes, corn, and spicy Mexican flavors for a combination of flavors that the whole family will love. I’d love this with grated cheese, avocado, or even corn chips to add at the table, what do you think? Get the complete recipe for Slow Cooker Mexican Corn Chowder from 365 Days of Slow Cooking. Use the Index Page for Soup or Stew to see all the soup recipes that have been featured on this site. I love all of the flavors here! Thanks Lydia, so do I!